Freemake Audio Converter for Windows XP - a utility that converts audio into the most common extensions for playback on a variety of devices. Extract music files from videos, combining two or more tracks. To select a media file for further processing, you need to drag the music with the mouse, or select it using the Audio button. When the music track is in the workspace, the choice of the desired function is available: convert to the required format or glue several audio recordings. 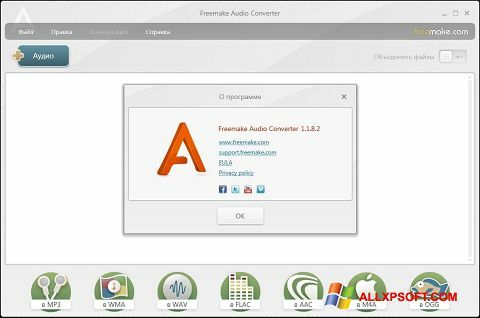 You can free download Freemake Audio Converter official latest version for Windows XP in English.